Eagle Mountain • No bomb found; a former hoops coach who was arrested after saying he had explosives in his car faces criminal charges. 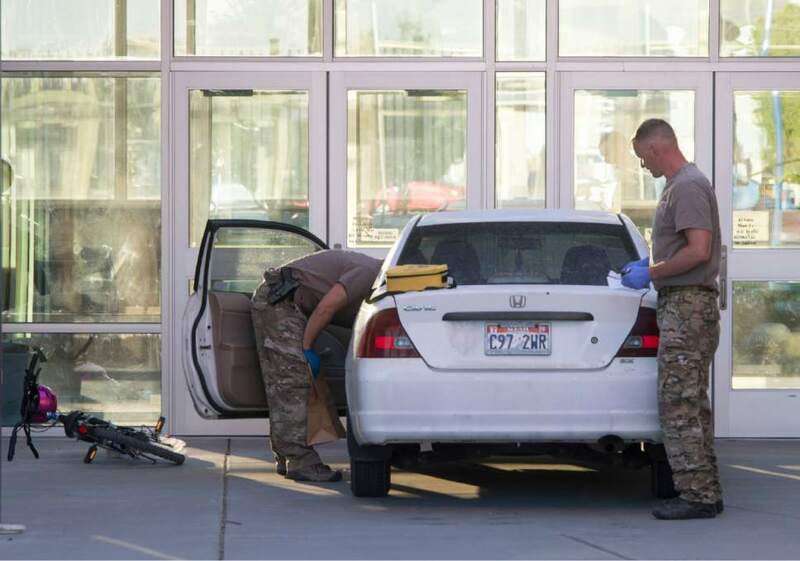 Rick Egan | The Salt Lake Tribune Police check out the suspect's car at Eagle Valley Elementary School in Eagle Mountain in September. The school was evacuated after a masked man entered the school and claimed the car contained explosives. 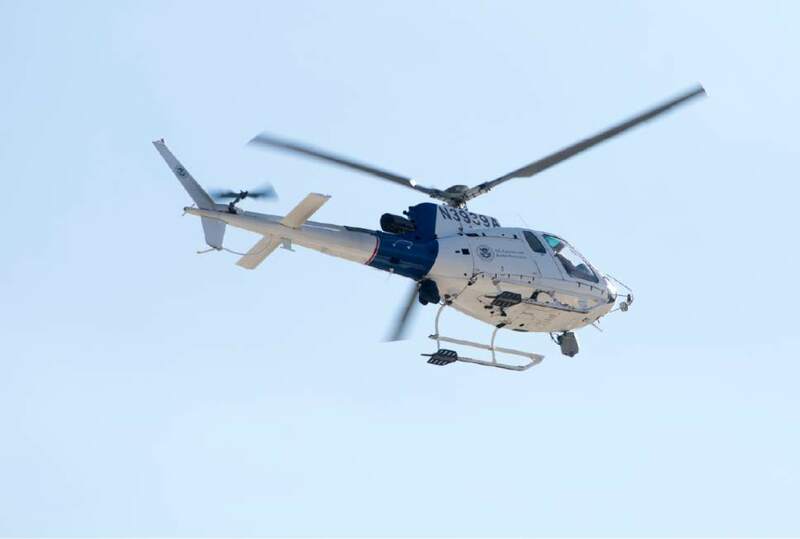 Rick Egan | The Salt Lake Tribune A helicopter flies over Eagle Valley Elementary School in Eagle Mountain. The school was evacuated after a masked man entered the school on Monday, Sept. 19, 2016. 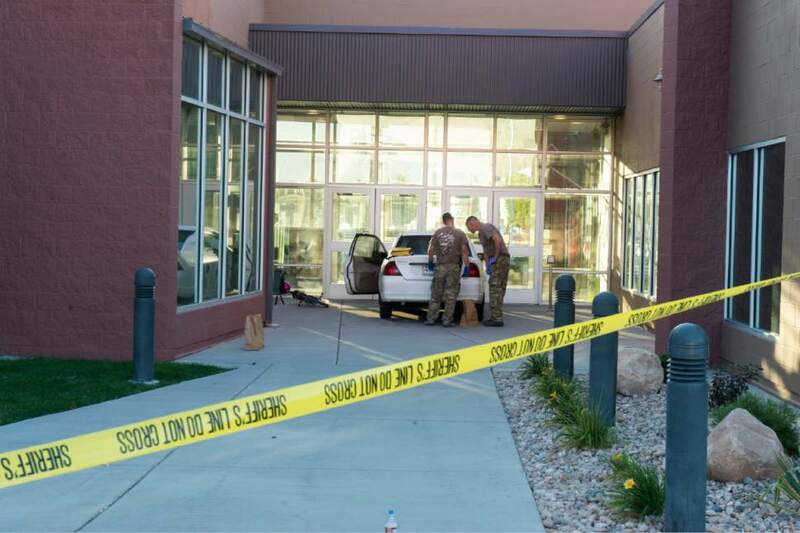 Christopher Dewitt Craig Rick Egan | The Salt Lake Tribune Eagle Valley Elementary in Eagle Mountain was evacuated after a masked man entered the school on Monday, Sept. 19, 2016. 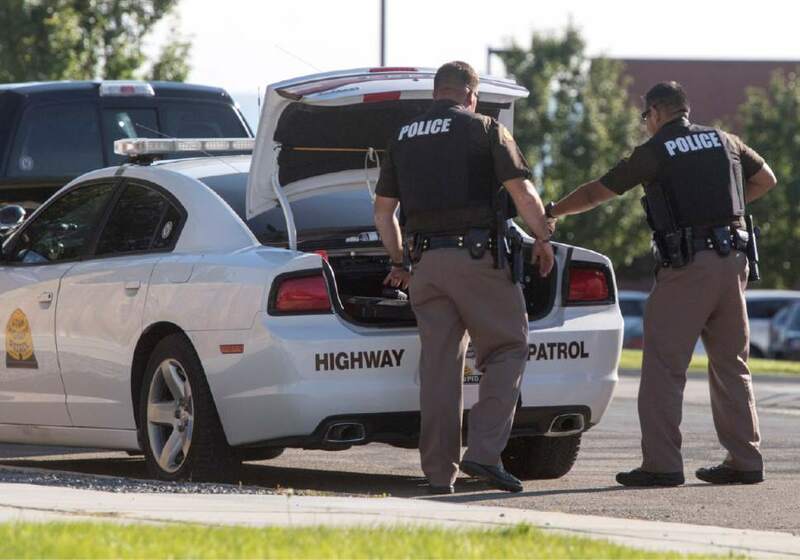 Rick Egan | The Salt Lake Tribune Police check out the suspect's car at Eagle Valley Elementary School in Eagle Mountain. The school was evacuated when a masked man entered the school on Monday, Sept. 19, 2016. 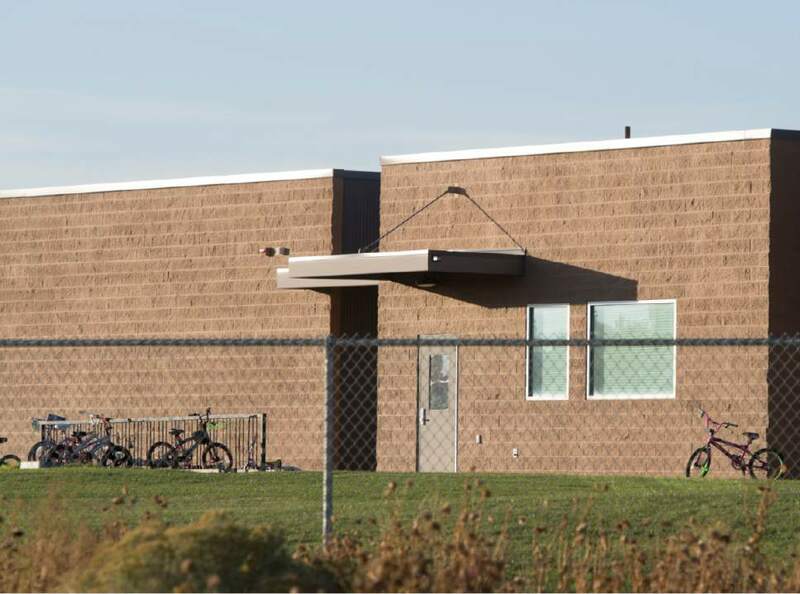 Rick Egan | The Salt Lake Tribune Students' bicycles were left at the school after many of the students had to climb over a fence when they evacuated Eagle Valley Elementary School in Eagle Mountain. The school was evacuated after a masked man entered on Monday, Sept. 19, 2016. Rick Egan | The Salt Lake Tribune Police block off the road in front of Eagle Valley Elementary School in Eagle Mountain. The school was evacuated after a masked man entered the school on Monday, Sept. 19, 2016. 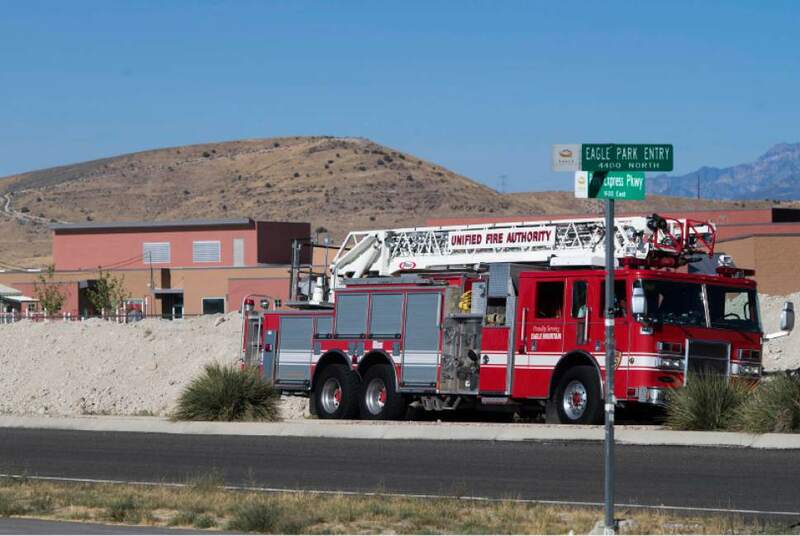 Rick Egan | The Salt Lake Tribune A Unified Fire Authority truck is idle across the street from Eagle Valley Elementary School in Eagle Mountain. The school was evacuated after a masked man entered the school on Monday, Sept. 19, 2016. 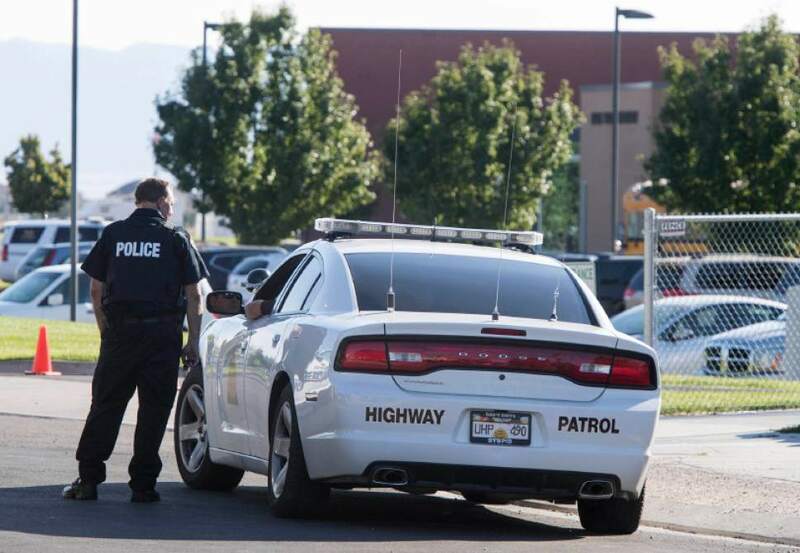 Rick Egan | The Salt Lake Tribune Police block off the road in front of Eagle Valley Elementary School in Eagle Mountain. The school was evacuated after a masked man entered the school on Monday, Sept. 19, 2016. 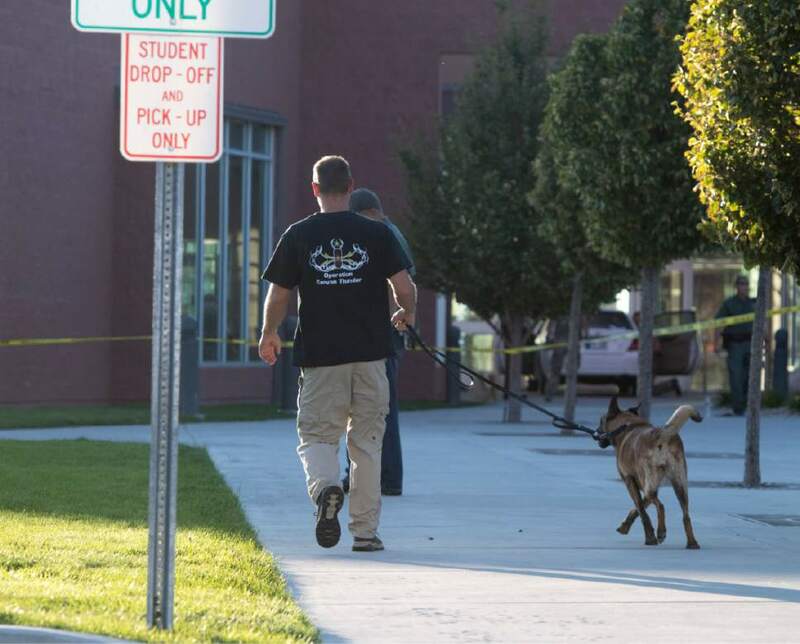 Rick Egan | The Salt Lake Tribune A police dog checks out the school grounds at Eagle Valley Elementary School in Eagle Mountain. The school was evacuated after a masked man entered the school on Monday, Sept. 19, 2016. 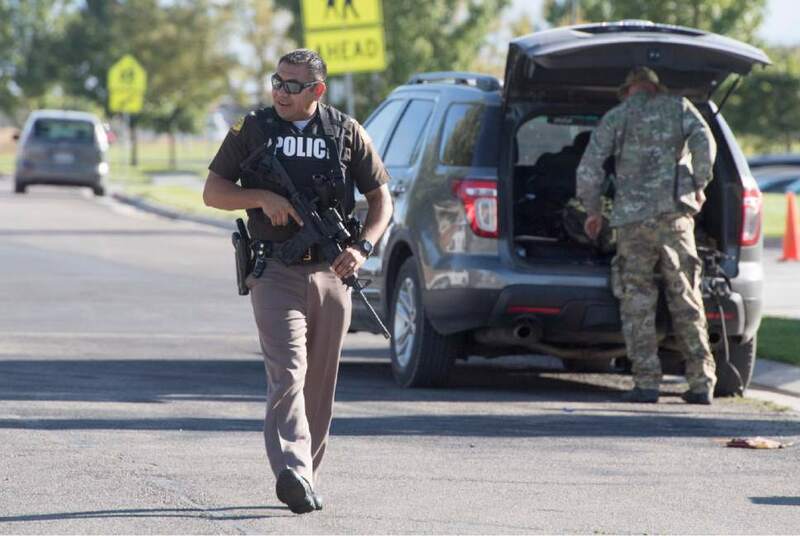 Rick Egan | The Salt Lake Tribune Police block off the road in front of Eagle Valley Elementary School in Eagle Mountain. The school was evacuated after a masked man entered the school on Monday, Sept. 19, 2016. Eagle Mountain • A man wearing a mask walked into an elementary school Monday and said that he had parked a car containing explosives next to the school&apos;s front door, police said. Christopher Dewitt Craig, former head basketball coach at Utah State University Eastern, said in an email sent to multiple news organizations that the bomb threat was part of a campaign against black people who challenge racism. 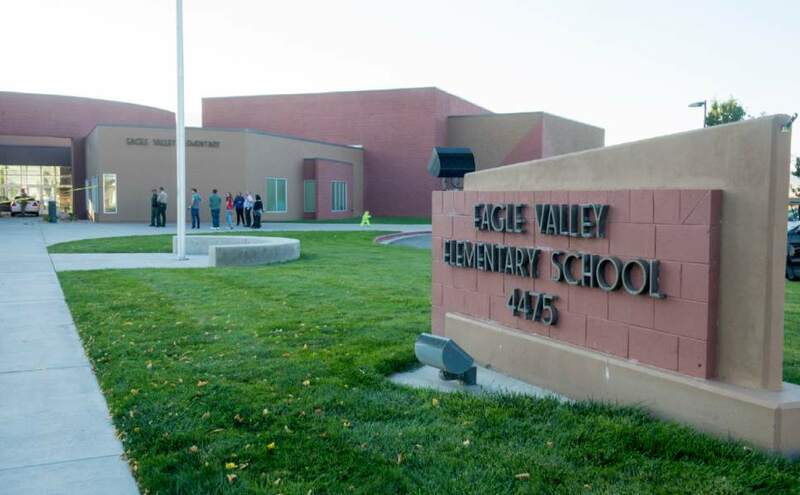 Craig drove a car to the front doors of Eagle Valley Elementary, 4475 N. Heritage Drive, and walked inside, wearing a ski mask and a long, light green tunic, said Utah County sheriff&apos;s Sgt. Spencer Cannon. He approached an administrative worker, told her to evacuate the school so no one would get hurt and then walked back out to the car, said Kimberly Bird, assistant to the Alpine School District superintendent. Students and staff left their classrooms ­ each one has its own exterior door, said office assistant Wendy Wakefield  and met outside before leaving the school grounds. Younger children walked to the city offices less than a quarter-mile away, and students in grades two through six walked to an employee&apos;s home. Buses later took the students to a church building, where parents picked them up. Meanwhile, Craig remained in front of the school. He told emergency dispatchers that he had placed explosives in the car near the school, so police did not approach him directly. Instead, they spoke on the phone and sent a robot with a microphone near the spot where Craig was lying on the ground, behind his car, Cannon said. Craig moved closer to the microphone, got out a book and read aloud a speech about perceived "social injustices" similar to those he described in the email he sent to The Salt Lake Tribune and other media. In that message, he identifies himself as Christopher Craig and as "the radical Islamic jihadist Muhammad Allah Al-Khidr," saying he would "call 911 with a threat of an explosive" at the school. The email describes a promised bomb threat and a hunger strike he plans to conduct in jail. "Racism is the reason for my hunger strike," the email reads, "to take this conversation deeper, to the truth, core and roots." He describes black men as "the most racist, bigoted group of homo sapien primates" and titles the message "In honor of Skylar Dore"  an allusion to a white Louisiana police chief who was fired after a profanity-laced Facebook post about the death of white police officers in Baton Rouge. "And This Day I go to kill myself in jail in honor of the most racially targeted group of humans = white police officers," the email states. "I cant donate money or post on Instagram, but my life I lay down for you to the death. Thanks fellas, it is truly an honor." The sender says he will await the return of Prophet Isa, the name for Jesus Christ in the Quran. The email was sent to media outlets, Dallas Mavericks owner Mark Cuban, U.S. Secretary of State John Kerry and others. More than two hours after the school&apos;s evacuation, Craig agreed to cooperate with police, who arrested him as he lay on the ground and placed his hands behind his back, Cannon said. Police asked Craig to open the trunk before they took him into custody, Cannon said, but he declined that request. Investigators found no evidence of explosives in the car, according to a news release from the sheriff&apos;s department. Officers also searched the school and Craig&apos;s Eagle Mountain home, finding nothing suspicious inside. School was scheduled to resume as usual on Tuesday. Counselors and law enforcement officers will be at the school, administrators wrote in a news release. Students had completed an evacuation drill last week, Wakefield said, and the students appeared to be "calm and trusting" during their exit from the school Monday. "They knew everything would be OK," Wakefield said. Some of the students "were a little more nervous" as they were taken off school grounds and realized the evacuation was not a drill, Wakefield said. "But they were focused on following instructions." Bird said the district "definitely" would review security measures at the school. One employee, a cafeteria worker, did not hear the evacuation order and remained in the school throughout police negotiations with Craig, Bird said. The woman started to go outside, Bird said, but she saw the many police officers and returned into the building and locked herself in a room, per emergency protocols. Craig was booked into the Utah County jail Monday night, Cannon said in a news release, on suspicion of threat of terrorism, a second-degree felony; interference with an arresting officer, a class B misdemeanor; failure to disclose identity, a class B misdemeanor; disrupting operation of a school, a class B misdemeanor; and disorderly conduct, a class C misdemeanor. Bail was set at $25,000, cash-only. Craig has called himself an "Islamic jihadist" during prior brushes with the law in which he exhibited strange behavior. On July 10, 2013, Craig was arrested in Thatcher, Ariz., after allegedly entering a classroom on the campus of Eastern Arizona College, where he waved a Bible and asked the instructor whether he was Mormon. Craig then left the classroom and went to another campus building, where he continued to make derogatory statements about Mormons and Catholics before being arrested later at a Thatcher store, according to The Sun Advocate, of Price, where Craig lived at the time. Craig was booked into Graham County jail in Arizona on suspicion of disorderly conduct and interruption of an educational facility. He was released July 15 after the Graham County district attorney did not file charges. Soon after, in early August 2013, authorities in Colorado were warning churches about Craig because he said that Mormons and Catholics "would be destroyed" in the coming weeks. Steamboat Springs police Capt. Jerry Stabile said Craig had been filming himself driving around the mountain city with a towel on his head and sunglasses, according to The Associated Press. In the most recent case, filed in April 2014, Craig allegedly drove his car onto an elementary school playground. He pleaded guilty a year later to misdemeanor counts of driving on a suspended license, failure to disclose identity and attempted reckless endangerment. Charges of disruption of activities in or near a school building and reckless driving were dismissed. A judge closed that case by giving Craig credit for 40 days of time served, the court docket says, apparently referring to the 40 days of jail time he served in drug cases.